Behold! You are gazing upon the future of Volkswagen. It is not in peculiar diesel hatchbacks that find clever ways to skirt emissions regulations, but in clean electric cars built in crossover SUV bodies that Americans might actually buy. This is the Volkswagen I.D. Crozz II concept. If this looks familiar to you, good eye. This is an update of the I.D. Crozz concept from April that brings the idea much closer to production. It’s not an electric Type 4 after all, but what can you do. This is the third of a trio of electric VW concepts we’ve seen lately, starting with the I.D. Concept from last year—essentially an electric future-Golf—and the I.D. Buzz, which is the electric comeback of the classic VW Microbus. 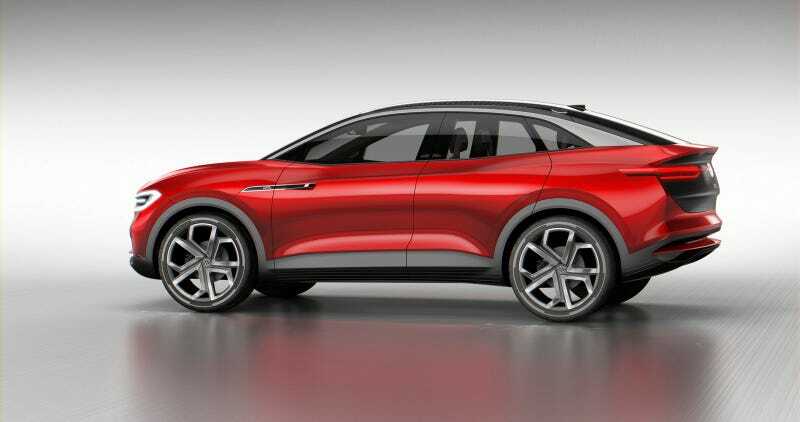 All of them apparently represent future production models, and VW says it hopes to have 23 fully electric cars in its lineup by 2025. Say what you want about crossovers (or “four-door coupes,” which this also claims to be) I mostly like the design and the elegant, grille-less face of these new electric VWs. It’s got nice, clean lines and a good shape, and I like how the end tapers off into a kind of spoiler. Here are the specs that matter: two electric motors, one driving the front wheels and the other driving the rears. It has a 225 kW battery pack, can do up to 112 mph, and can charge up to 80 percent in 30 minutes on a fast charge. Expect a production version of this, and the I.D. as a Golf, around 2020. Then you can enjoy the electric crossover future, like these nice-looking people do.